With lots of colorful varieties Euphorbia milii commonly called the Crown of Thorns Plant. They are a long flowering plant and easy to grow in a warm climate. Many hybrids have been produced in Thailand and it is regarded as a ‘Lucky Plant’ by the Chinese. However these colorful plants are actually native to Madagascar. It must be understood that these are highly hybridized, many without cultivar names, so flowers and form will differ greatly. These are succulent plants and will grow well indoors, with a long flowering nature they are very popular as a house plant. The ‘Lucky Plant’ idea revolves around the flowers, when the inflorescence includes 8 individual flowers the luck will follow. Flower colours vary from red through pink and yellow to white, the modern hybrids showing more variety and many with larger flowers than the species. Good filtered light is essential for growing indoors. They will grow well in full sun as well. 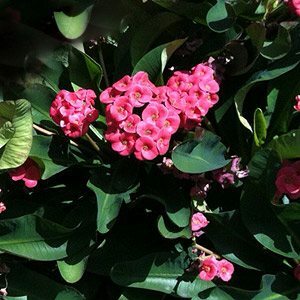 Euphorbia milii (crown of thorns) do require a free draining potting mix and between watering’s the potting soil needs to be allowed to partially dry out. Best watered from below as water accumulation on the foliage can cause disease and rot. These are not a plant that thrive in humid climates. Fertilizer applied in the form of slow release pellets in spring and then regular applications of a liquid seaweed fertilizer will help promote strong growth. As the milky sap is both poisonous and a skin irritant ( it can cause dermatitis) you should wear gloves when handling these plants. Simple to propagate from stem cuttings in spring. You will find that the stems when cut exude a sap, this needs to be dried off before planting. Leave to dry for a few days until the cutting callus es over. Cuttings will strike in a succulent potting mix, roots should form in 1 – 2 months. Plants should be ready to pot in in 3 – 4 months. Pruning is also easy, best carried out in warm dry weather so that the plant seals over the cut quickly.